Dean Donde Plowman (second from left) is joined by university dignitaries as the College of Business Administration broke ground on a new building on March 4, 2015. 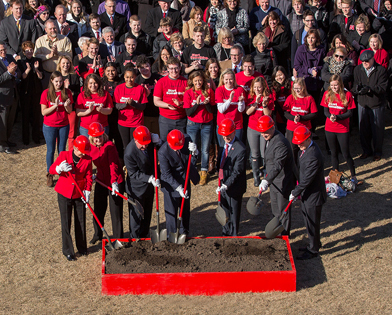 The College of Business Administration Groundbreaking Ceremony for the University of Nebraska–Lincoln building was held on Wednesday, March 4 with more than 350 university dignitaries, students, faculty, staff, alumni and business partners. A brief ceremony was held inside the Esther L. Kauffman Academic Residential Center Great Hall followed by groundbreaking at the site of the new building at 14th and Vine Streets. The ceremony emcee was Dr. Donde Plowman, James Jr. and Susan Stuart Endowed Dean of the College of Business Administration, and included remarks from the following dignitaries: Harvey Perlman, UNL chancellor; James Linder, interim president of the University of Nebraska; Ellen Weissinger, UNL senior vice chancellor of academic affairs; Howard Hawks, University of Nebraska regent; Brian Hastings, president and chief executive officer of the University of Nebraska Foundation; Tonn Ostergard, CBA capital campaign chair; and Marjory Bell, freshman management major from Oak Park, Illinois. Rocktavo, a UNL student a capella group, provided entertainment and the Big Red Alumni Pep Band led the group outside for the ceremonial breaking of the ground at the construction site. The $84-million, 240,000-square-foot College of Business building is the largest academic building project in recent history at UNL. Designed by Robert A.M. Stern Architects of New York and Alley Poyner Macchietto Architecture of Omaha, the building is funded exclusively from private donations from CBA alumni and business partners. The new building will celebrate the college’s 100-year legacy of educating business leaders by providing a place for innovative teaching and student technology. The Big Ten college of business will offer interactive learning in state-of-the-art classrooms. It will also enable one-stop student support services and a space to host many events in the future. As part of Chancellor Perlman’s initiative to increase enrollment at the university, the new building will have an impact on the college’s ability to recruit top students and faculty to Nebraska. The new building will also assist with the university’s overall recruitment efforts as any major can get a business minor (link to: http://cba.unl.edu/academic-programs/programs-and-degrees/business-minor/ ). As a business minor, students will take a course in each of the six areas of business (accounting, business law, economics, finance, marketing and management) which can be tailored to meet the student’s schedule as courses are offered on-campus and online. Construction on the new facility is scheduled to begin later this spring and is expected to open for the fall 2017 semester. To donate to the building, contact the University of Nebraska Foundation at 402-458-1100 or visit http://cba.unl.edu/building. Have a Question and Don't Know Who to Ask?